← Can Gilead Outperform The Biotech Index? 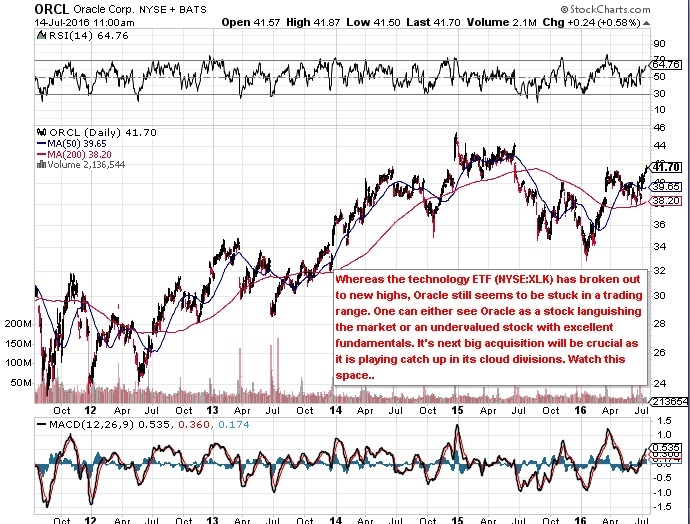 Oracle (NYSE:ORCL) is just after selling $14 billion worth of bonds probably to fuel its next acquisition. The size of the sale illustrates to me that this time the tech company is going big. It has to. It came late to the cloud party and although recent quarters have been very encouraging, it needs to keep driving ahead as its only a matter of time before its existing customers (especially database) transfer over to the cloud. Oracle obviously is first in line to get them but will be facing huge competition in forthcoming quarters which means its next acquisition is crucial.. This entry was posted in Stock Picks and tagged orcl. Bookmark the permalink.